Here are a few of the most commonly asked questions we get about algae problems in ponds. Algae encompasses a large group of simple photosynthesizing plant-like organisms that range from microscopic single cell algae to giant kelp. 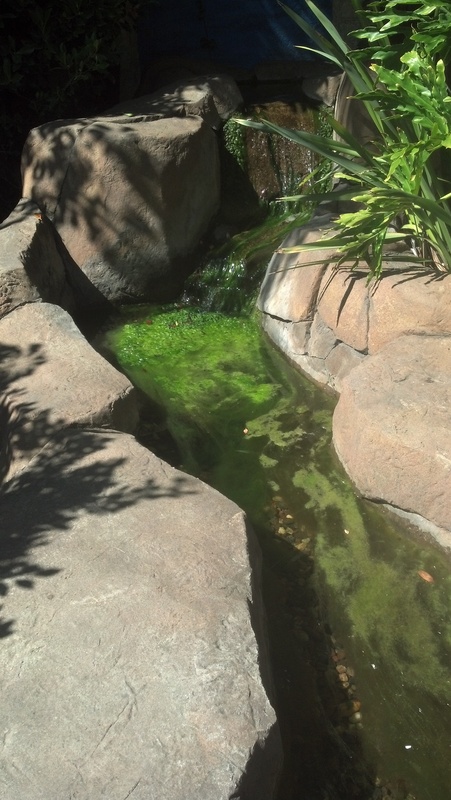 In ornamental ponds we typically find 2 kinds of nuisance algae: string algae and “green water” algae. Waterfall and stream before pond cleanup. Where does algae come from? Algae grows when there is sufficient light and nutrients. Light of course comes from the sun, and the nutrients come from outside sources like fish waste, excess fish food, decaying plants. Eventually, fish food becomes fish waste, which is great algae food. Is algae dangerous to my fish? Not usually. In cases without adequate water circulation, it is possible for algae to cause large pH spikes, or oxygen depletion, both of which can be fatal to fish. If you have a waterfall or other oxygenating water feature in your pond, then this is probably not a concern. How do I get rid of algae? 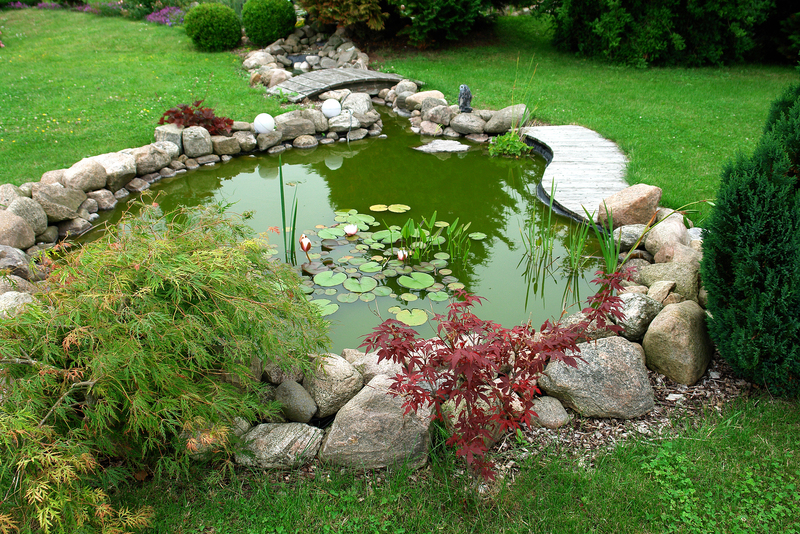 Small amounts of algae indicate a balanced and healthy pond. 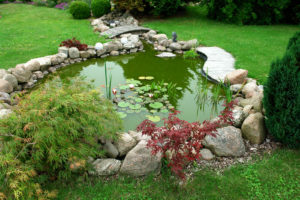 Large amounts indicate something if “out of balance” with your pond, so the best solution is to get to the root cause of the problem before trying to address it. Is there something that I can add that will kill the algae? There are a number of commercially available chemical algaecides. Some of these work well, many are poisonous to fish if not dosed properly, and none will usually solve the underlying problem. We regularly employ a variety of algaecides to combat specific algae problems. These products are useful, but should not be your first alternative.